(OTTAWA – February 11, 2013) -- New financial contributions from WWF in support of polar bear research are improving the knowledge of polar bears in Canada. Research projects are underway across the Canadian Arctic to update information about the status of polar bears in Baffin Bay/Kane Basin, and Viscount Melville Sound. There are various reasons why a subpopulation may be targeted for surveying efforts: updated information needed for harvest management, impacts of a changing ice regime, or simply the span of time since the last survey. In the case of Viscount Melville Sound, the existing population surveys are in need of updating due to span of time since the last survey. And in Baffin Bay, management and harvest is shared between Canada and Greenland, making good, current information doubly important to ensure a sustainable harvest level. 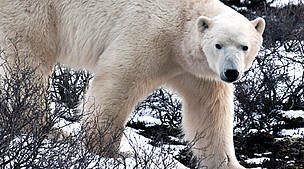 Accurate population estimates are necessary for effective conservation of polar bears, and current population surveys are an important part of the basis for sustainable management of the populations. “Polar bears are very important to Inuit, culturally, spiritually and economically,” said Drikus Gissing, Director of Wildlife Management for the Government of Nunavut. “Nunavut has faced some questions about our management of the bears, and so our response is to demonstrate to the world that we are managing Nunavut populations sustainably, starting with a commitment to research to ensure management decisions are made based on up-to-date reliable information on status of sub-populations.” Nunavut manages part or all of 12 out of the 13 sub-populations in Canada. Results from the above-noted surveys will be completed and shared beginning in April 2013. WWF made contributions of $82,000 to the Government of the Northwest Territories and $111,000 to the Government of Nunavut via Environment Canada, towards the total costs of these surveys. These funds were raised through the Arctic Home campaign from engaged Canadians and matched by The Coca-Cola Company. “This underscores our commitment to work with local people and governments to maintain sustainable polar bear populations,” says Martin von Mirbach, Director, Arctic Program, WWF-Canada. There are 13 subpopulations in Canada: one is shared with the United States while three are shared with Greenland. Polar bear subpopulations in Canada are surveyed according to inventory schedules based on priority-need. This means that each of the 13 subpopulations in Canada are surveyed on a five to 15 year interval.